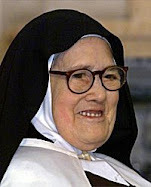 Note- Anne Louise Lateau has been officially declared a “Servant of God” and her cause for Beatification was opened in Rome in 1991. –Editor. 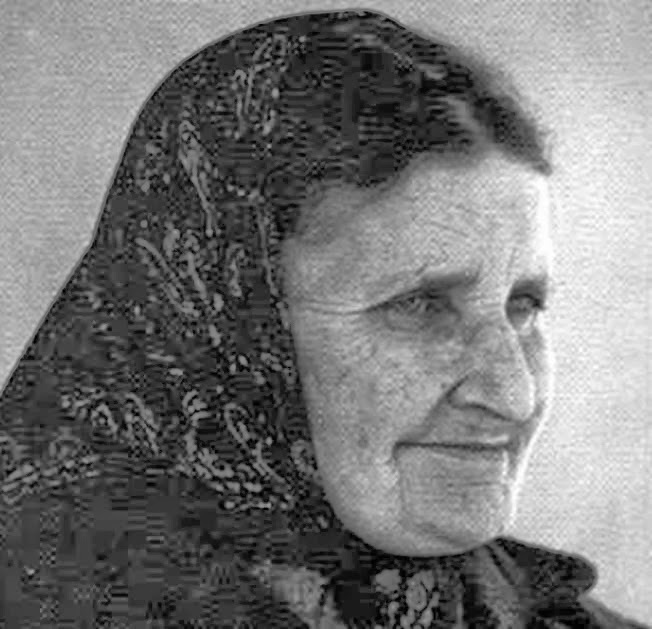 Anne Louise Lateau was born at Bois d'Haine, Belgium on 13 January, 1850. Her father, Gregory was then 28 years old, was a simple metal worker, employed at a neighbouring foundry. Sadly, he contracted smallpox and died on April 17, 1850, three months after the birth of Louise, leaving the mother Adele (Pissens) Lateau to care for her, and her two young sisters. 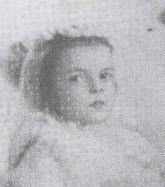 The eldest daughter, Vosine, was just three years old; the second, Adeline, a little more than two; and the third, Louise, was just under three months. At the time of their fathers death, nothing could he imagined more helpless and desolate than the condition of this little household. 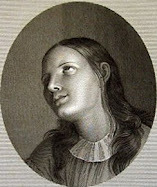 The poor mother, who had almost died in giving birth to Louise, was still quite ill and not yet able to leave her bed; Louise herself was suffering from the malignant disease [smallpox] which had carried her father to the grave ; and, to crown their misery, friends and neighbors all shrunk away, in terror, from the infected dwelling. Little Vosine, age 3, did all that a little child could do. Passing back and forth between the sick bed of her mother and the cradle of her infant sister Louise, she managed to bring to them, with her tiny hands, the absolute necessaries of life. Days passed by and the scanty resources of the poor cottage were soon exhausted, and hunger began to be felt. In this extremity, help finally came from the hands of a good peasant, named Francis Delalieu. This most worthy man, suspecting how matters must be, made his way into the house, twelve days after the father's death. He found Louise close to dying, while the rest of the family were reduced to last extremes. He sent at once for provisions, and relieved their most pressing necessities: nor did he cease, from that day onwards, to watch over and assist them, until they were all restored to health and strength. May the name of this simple peasant, Francis Delalieu, and his extraordinary charity be always remembered! The mother's illness was serious and protracted, and finally after two and a half years she regained her former health, however she found herself and her family with barely any means of support, except the little piece of ground on which the cottage stood, and which, in happier days, had been her own marriage portion. But she accepted her hard lot with a bold and courageous spirit. 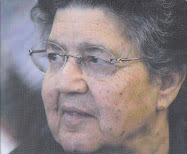 She resolved to struggle against poverty, and to keep herself independent. Morning and night she devoted herself to the care of her children, and all day long she toiled for their daily bread. While she was away at her work, she had to leave them at home by themselves, putting the two younger children under the care of the oldest. 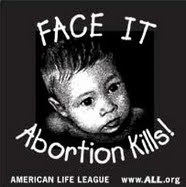 Poor little children, they had many privations to endure! -They had to bear the cold of winter often without a fire, and we are told that their food was extremely frugal. Nevertheless, thanks be to God they grew up strong and healthy, and the time soon came when they were able to help their mother and share in the daily labors. At the age of eight, Louise was placed, for a short time, with a feeble old woman of the neighborhood, who required assistance while her son was absent at work. Later on, she was sent to school for five months. 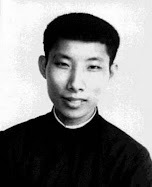 There she manifested good dispositions, learned her catechism, and made some progress in reading and writing. This was all the schooling she ever received. At age eleven, she made her First Holy Communion ; and then went to live with an aunt on her father’s side who lived at Manage. This good woman was seventy-eight years of age, and very infirm; she died two years afterwards, and Louise, who had served her during that time with remarkable zeal and devotion, went next into the service of a lady in Brussels. Here she became ill and was obliged to leave after seven months. But afterwards this woman never ceased to regard Louise with much admiration and affection, and came to see her from time to time at Louises’ home in Bois d'Haine. Within a few weeks of arriving home, Louise was well again, and once more at work; having found a new engagement in the family of a small farmer at Manage. From this place she was, soon after, called back home by her mother; and from this point on she remained at home for the rest of her life, devoting herself entirely to needlework (sewing) and household duties. Another striking feature of her nature is her charity. Poor herself, she has always had a passion for helping the poor. When as a child, we see in the facts already given above that she devoted herself to the care of the sick, with a remarkable forgetfulness of self and unusual tact, according to those involved. After she moved back home, for many years, when someone died in the town, it was almost always Louise who helped the grieving family and prepared the body for burial. (Photo left- House of Louise Lateau) In 1866, the horrible and deadly disease cholera became prevalent in Belgium, and broke out at Bois d'Haine. It cannot be said to have made great ravages there, but, as in many other places, it created a panic and gave occasion to certain acts of cowardice, which one can easily understand, perhaps even excuse, and out of respect for human weakness, one would prefer to leave untold, if it were not important to reveal in this narrative. At this time, the cholera plague struck first a working man's family, composed of seven persons. The four sons, yielding to panic of the contagious disease, abandoned the house, leaving their father, mother, and sister struck down by its ravages. Knowing of Louise’s holiness and charity, the parish priest, whose assistance was needed also by others, sent for Louise. 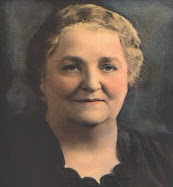 She took up her abode in the abandoned house, and alone attended upon the father and mother up to their last hour—they died both on the same day; and she continued her kind care to their daughter until the sons, feeling doubtless some remorse, returned to the cottage for an instant, just to carry their sister away to another house. Thus left alone, Louise laid out the two dead bodies; then, with the assistance of her sister Adeline, placed them in a coffin and managed to carry them out of the infected house. Some men, encouraged by the heroic example of these young girls, then took the bodies to the cemetery. Louise, with the doctor and the priest, continued this work during the whole time that the epidemic lasted. She never left the houses into which the plague had manifested. Of course, she could not be everywhere at once; but she nursed six cholera patients in the month, continually laid out the dead, and even carried several of them to the cemetery. And she did all this when she was a mere child of sixteen. When the pestilence finally abated, she retired again into obscurity. 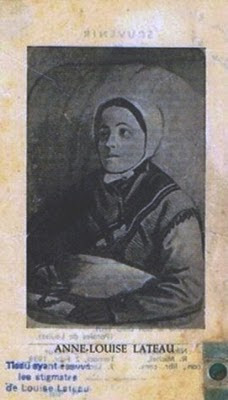 Because of her past reputation of universal charity for the sick, for years afterwards, when someone in town was sick and had no one to care for them, Louise was called for, and she immediately went to the sick person, regardless of the type of illness, be it contagious or not, and cared for them with an remarkable zeal, sincere charity and concern, and would stay and care for them as much as was possible. Louise Lateau is described as a person of simple upright character, and of a cheerful, kindly, unselfish disposition. She is intelligent, but not exceedingly so, quite simple and not at all prone to exaggeration or imagination. Kindness and good common sense seems to be her distinguishing characteristics. Her piety, too, is practical and unobtrusive. Entirely free from exaggeration, she follows the beaten paths; but she follows them with fidelity. She loves solitude and retirement ; and, except in obedience to her ecclesiastical superiors, she never speaks about the extraordinary phenomena of which she is the subject. 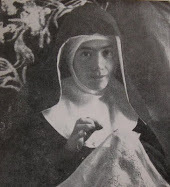 On this last point Doctor Lefebvre made very minute inquiries ; and he assures us that, though she has some female friends of her own age, to whom she has been affectionately attached from her childhood, the question of her ecstasies and her stigmata is never spoken of between them. In fact, she maintains the same reserve even with her mother and her sisters, and they, on their part, never introduce the subject in her presence. Thus we can see her extreme reserve in regards to the extraordinary mystical graces that she has been given by God. On Friday, April 24, 1868, the first trace of the Stigmata appeared. She noticed that some blood flowed, on that day, from her left side. With her usual reserve she made no mention of it to any one, not even to her mother or sisters. On the next Friday, blood came again, from the same spot, and also from the upper surface of both feet. She now confided the matter to her spiritual director, the “Cure” or Parish priest of Bois d'Haine. The priest, though greatly struck by so extraordinary a phenomenon, wisely and prudently downplayed the event. He tried to restore her peace and tranquility, and told her to say nothing about it. On the third Friday, May 8, blood flowed, during the night, from her left side, and her feet; and towards nine o'clock in the morning, it came also abundantly from the palms and backs of her hands. She passed for the first time, into an Ecstasy, on Friday July 17, in the same year: and two months later, on Friday, September 25, the coronet or crown of bleeding points appeared around her head. All these phenomena, from the time of their first appearance, were repeated on each successive Friday, with little or no interruption: the only exceptions being, that the bleeding coronet was occasionally absent during the first year, and that the other Stigmas failed to bleed on two occasions. From the time that blood began to issue from her hands, the extraordinary condition of Louise could no longer remain a secret. The news spread abroad. Crowds assembled weekly round her mother's house; and the excitement soon became so great that the ecclesiastical authorities felt it their duty to take some action in the matter. It was then that they asked Doctor Lefebvre to institute a thorough scrutiny of the whole case, from a medical point of view. His study commenced on August 13, 1868, and continued for one and a half years. With a view to investigate its character still more closely, Doctor Lefebvre, as he tells us, "installed a microscope" in the cottage of Louise, and examined the blood, at the moment of its escape from the body. In this examination he was assisted by two of his medical colleagues, who were both skilled in microscopical researches, Dr Hairion, Professor of Hygiene, and Dr. Van Kempen, Professor of Anatomy. After a careful scrutiny, they were all fully satisfied that the stigmatic blood of Louise presents no peculiarity of structure or appearance. The red and white corpuscles are quite of a normal character, and are mixed in the ordinary proportion. The plasma, or liquid in which they are suspended, is colorless, as is usual, and perfectly transparent. In a word, the red fluid of the Stigmas, whether taken as a whole or examined in its constituent elements, is simply an average specimen of healthy human blood. The stigmata appeared every week around midnight on Thursday evening, and remain until late Friday afternoon, usually around 5:00pm. In his effort to be absolutely thorough in his investigation, on two separate occasions, Dr Lefebvre with one other Physician placed specially fitted gloves on Louise, affixing them with a special cord and wax seal that made it impossible to tamper with without detection. 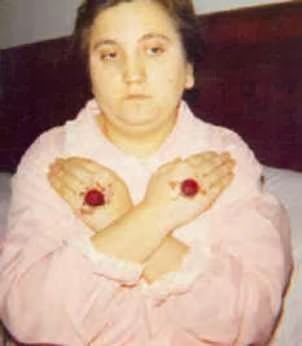 The end result was that the stigmata appeared on Thursday evening, as usual, with the sealed gloves on, giving the attending Physicians sufficient proof of the supernatural origin of the Stigmata. There can be little doubt that the bleeding of the Stigmata is a source of pain, though Louise never spoke of it. During the Ecstasy, indeed, she was probably unconscious of pain, as she was of every other bodily sensation. But before the Ecstasy has set in, and after it has ceased, Doctor Lefebvre was convinced that she suffered acutely; judging as well from pathological considerations, as from the expression and movements of her countenance, and her obvious sensitivity in those areas. Towards evening on Friday, the bleeding usually stops; but not always at the same hour. On the next day, the Stigmata are dry and somewhat glossy. Here and there may be observed some scales of dried blood, but they are soon cast off; and a new epidermis is furnished by Nature instead of that which was destroyed. Thus, early on Saturday morning, Louise is back at her ordinary work. She only interrupts her work to go to Mass to receive Holy Communion at the Parish Church. 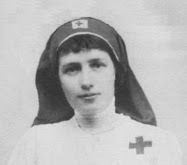 Louise's ecstasies normally began between 9:00-10:00am on Friday morning, and normally lasted until about five in the afternoon that same day. Louise, being unfit for work on Friday on account of the bleeding Stigmata, is generally at her prayers when the ecstasy comes on. Nevertheless, the ecstasy comes on all the same, even though she be engaged in distracting conversation. Doctor Lefebvre has been present on many an occasion of this kind : and of one, in particular, he has given us a very exact record. "It is half-past seven in the morning. I open a conversation with the girl, and I make it a point to engage her attention with things the most indifferent. I ask her about her occupations, her education, her health. She answers my questions simply, exactly, briefly. During the course of this conversation, her look is calm, the expression of her face is natural, and it wears its accustomed colour. Her skin is cool: her pulse beats seventy-two in the minute. After some time the conversation languishes, and there is a pause of a few moments. I wish to begin again, but I perceive that Louise is motionless, with her eyes raised up and fixed in contemplation. She is rapt in Ecstasy." An account very similar to this, and written, like it, on the spot, is given to us by Doctor Imbert Gourbeyre, professor in the medical school of Clermont, in Auvergne. " I had been examining and questioning Louise," he says, " for an hour and a quarter. My last question was about the cholera patients whom she had attended. She told me she had seen nine or ten of them die. I ask her if she was afraid. She answers that she was not. ' Are you fond then of nursing the sick ?' I say; and I go on writing this question, with my eyes fixed on the paper. Louise gives no answer. I look up at her, and see that she is already in her Ecstasy." In the summer of 1869, Louise was directed by her spiritual superiors, to resist the Ecstasy, as far as lay in her power. This course was considered desirable for the purpose of a strict investigation of her case from a Theological point of view. It was even prescribed that, on Friday mornings, she was to remain at her ordinary work, whatever difficulty or pain she might experience in doing so. About this time, the Bishop of British Columbia, Doctor d'Herbomez, obtained permission from the ecclesiastical authorities to see the Ecstatica: and he presented himself at the house, attended by the Abbe Mortier, on Friday, 13 August, 1869, about 8:00am. When he entered, Louise was at work with the sewing machine. Her hands and feet were bleeding profusely. On her forehead, too, and round her head, in a complete circle, blood was flowing copiously, and it was streaming down over her face and neck. The sewing machine was covered with it; and only by the most painful exertions, was the poor girl able to continue her work. The Bishop entered into conversation with her, and asked her some questions. She answered with her usual quietness of manner, and with perfect intelligence, going on meanwhile with her task, according to the instructions she had received. All at once, the machine stopped short: her hands were still: her body motionless. The work had ceased, the Ecstasy begun. The attitude as well as the countenance of the Ecstatica undergoes many and frequent changes. 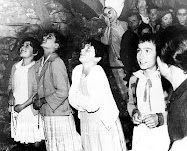 Now her body moves slowly round, as on a pivot, and her eyes seem to follow the progress of some invisible procession : anon she rises from her seat, advances a few steps, and raises up her hands in prayer. At one moment, her features expand, and a smile of delight plays across her face: at another, her eyelids fall, her features contract, and tears roll down her cheeks; again, she trembles and grows pale ; an expression of terror is depicted on her countenance ; and a stifled cry escapes from her lips. She often lays prostrate on the floor, arms extended in the form of a cross. Most startling and solemn of all is the closing scene of the ecstasy. The Ecstatic girl quickly rises from the floor, on which she has lain so long prostrate. Her pulse, which in the early stages was healthy and regular, beating seventy-five strokes a minute, has gradually become extremely rapid, and at the same time feeble. It is now hardly perceptible, and, when distinct enough to be counted, is found to be going at the rate of a hundred and twenty to the minute. Her breathing, too, has got fainter and fainter, and often cannot be recognized at all, except by having recourse to artificial means of observation. Death at length seems to be approaching. The body is cold: the eyes are closed: the head falls down on the chest. A. deadly pallor overspreads the face, and a cold sweat breaks cut through the skin ; even the rattle comes in her throat. This condition lasts about ten minutes; and then the current of life flows back. The body gets warm: the pulse revives: the cheeks resume their wonted color: the contracted face expands again. Then the reanimated girl looks gently round; her eyes fall softly first on one, then on another of the familiar objects around; and the ecstasy is over. Louise carries back from her Ecstasy a lively recollection of the scenes she has witnessed, She does not, indeed, talk of them freely : but, under the command of her Bishop, she answers Doctor Lefebvre with precision and simplicity, whenever he examines her about them. Her account is, that as soon as the Ecstasy comes on, she finds herself plunged in a sea of light: then figures begin to appear; and the various scenes of the Passion are enacted before her eyes. Not a word is spoken that she can hear : but the processions move sadly along, as if in living reality. The Apostles are there, and the Jews, the Roman soldiers, the holy women. 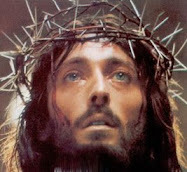 She sees the Saviour, too, and can describe minutely his appearance, His clothes, His wounds, the crown of thorns, the cross. But it would seem that Louise is favored, in her Ecstasy, with a still higher degree of illumination, akin to the spirit of prophecy. While she remains insensible to every other voice, she recognises at once, and obeys, the voice of one who has spiritual jurisdiction over her;—whether it be her Bishop, her parish priest, or any other priest to whom, for the occasion, jurisdiction has been given, unknown to her. 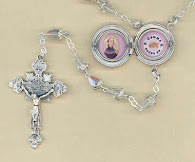 In like manner, sacred objects of any kind, presented to her lips,—blessed beads, or medals, or crosses,—are sure to bring a smile of joy over her face: while the very same material things, if not blessed, produced no effect whatsoever. This prophetic instinct, as it may be called, has been often tested, and never known to fail. On one remarkable occasion, it was manifested in a very wonderful way indeed. The reader will remember that Louise was visited, one Friday in August, by Doctor d'Herbomez, Bishop of British Columbia, attended by the Abbe Mortier; and that she passed into her Ecstasy, on that day, whilst at work with her sewing machine. Her distinguished visitors, having seen the Ecstasy thus wonderfully begin, resolved to remain throughout the day, and to watch its progress. About ten o'clock the Cure of the parish came in. He had been attending a sick woman in the neighborhood; and had with him, enclosed in a silk bag, a small silver case, called a Pyx, in which he had carried the Blessed Sacrament [Holy Eucharist] to her house. In the same bag was another silver case, which contained the Holy Oil used for the Sacrament of Extreme Unction. As the Cure had taken but a single consecrated host from the Church, and had given that to the sick woman, he of course believed that the Pyx was now empty: and it occurred to him that he might, without irreverence, employ the silk bag, with the two sacred vessels it contained, as a test for Louise. Accordingly, he took it out, just as it was, and gave it to the Abbe Mortier, who wished to make the experiment. The result was far more striking than had been expected. Before the Abbe Mortier had come within two yards of the chair on which Louise in ecstasy was seated, she rose up, as in a transport of joy, and fell on her knees in adoration. The Abbe retired a little: she followed him. He retired further: she followed still. And so he drew her round the room. Her attitude, during this scene, was very peculiar. She was partly kneeling, but her knees did not touch, the ground: her body leaned forward : her hands were joined as in prayer. She did not walk, but rather glided over the floor: and wherever the bag with the sacred vessels was carried, there she followed, as a needle follows the loadstone. At length, the silk bag, with its contents, was put aside. She then resumed her seat, and subsided into her state of motionless contemplation. This extraordinary scene was repeated several times that day; the sacred vessels being presented sometimes by the Bishop, sometimes by the Abbe Mortier. At first, the only witnesses present, besides the mother and sisters of Louise, were the three ecclesiastics ; and it was wisely judged expedient to secure, if possible, the presence of some distinguished layman. A message was accordingly sent to an eminent statesman, who happened, just then, to be staying at his country house, not far off. He came at once to the house of Louise; and along with the others, witnessed, again and again, the strange phenomena described above. The Bishop conjectured that, by some chance, a consecrated host, or possibly a part of one, had remained in the Pyx, without the knowledge of the Cure: and that this was the cause of all the emotions, and the movements of adoration on the part of Louise. He proposed, therefore, to separate the sacred vessels, and to test the effect of each of them individually, separately. First he took the case containing the Holy Oil, and presented it to the Ecstatica. No effect was produced until it touched her lips; and then she smiled, as she is accustomed to do, at the contact of things that are blessed. The Pyx was next presented. When it was jet two yards off, the transport of joy returned: she fell upon her knees, in adoration, as before, and followed the sacred vessel whithersoever it was carried. It was five o'clock in the afternoon, when the Bishop and his three fellow-witnesses left the cottage. They went at once together to the Parish Church. There, in the presence of all four, the Pyx was opened, and it was found to contain a pretty considerable fragment of a consecrated Eucharist. The statesman, who had been so unexpectedly called from his home in the morning, and had passed the greater part of the day in the house of Louise, went home deeply impressed and edified with the scenes he had witnessed, and drew up, at his leisure, a careful report of the facts. This report was subsequently confirmed, even to the smallest details, by the ecclesiastical witnesses; and from it has been mainly derived the account which has here been set forth. The events of this memorable day were soon brought to the knowledge of Doctor Lefebvre. He recognized, at once, that the facts were established by evidence which few would call in question. But he fancied that some might be found who would attempt to account for these facts by natural means, and would refer them, perhaps, to those mysterious powers, supposed by some philosophers to be developed in certain peculiar states of the mind, and known under the name of Clairvoyance. They would say, that the girl, in her trance, enjoyed an exceptional keenness of intellectual vision, by virtue of which her mind was enabled to pierce through the silk bag and the two silver cases ; and thus she became conscious that the one contained only the Holy Oil, the other, a consecrated host. To meet this explanation, a new and ingenious test was devised by Doctor Lefebvre. On Friday, 19 November, in the same year, the Cure of Bois d'Haine came to the house of Louise, accompanied by an eminent professor from Tournay, the Reverend Canon Hallez. It was 9:00am, when they arrived, and Louise was already in her Ecstasy. They had brought with them a Pyx, exactly resembling the one that had produced such wonderful effects on the thirteenth of August; and it was enveloped in the same silk bag that had been used on that occasion. In the Pyx they placed a small host, not consecrated. Here, then, all the material conditions were exactly the same as before. Yet when the silk bag, with the Pyx in it, was presented to Louise, and even pressed against her lips, there was no change, no act of adoration, not even a faint movement of the features: she remained fixed in contemplation, insensible, motionless. It was plain, therefore, so far as these experiments went, that the suggested theory of Clairvoyance, even if admitted to be true, would not be sufficient to account for the facts. Louise was vehemently affected by the presence of a consecrated host, while she was insensible to the presence of a host that was not consecrated. Consequently she possessed, for the time being, not only the extraordinary power of penetrating, with her mental vision, through the silk bag and the silver case, but the still more extraordinary power of discerning a Eucharistic host that was consecrated from one that was not: and such a faculty of discrimination as this, has never yet bean ascribed, even by the wildest visionary, to the powers of Clairvoyance. The section below is taken from the book "As the Bishop saw it- From America to Rome" By Caspar Henry Borgess. Edited by Very Rev. 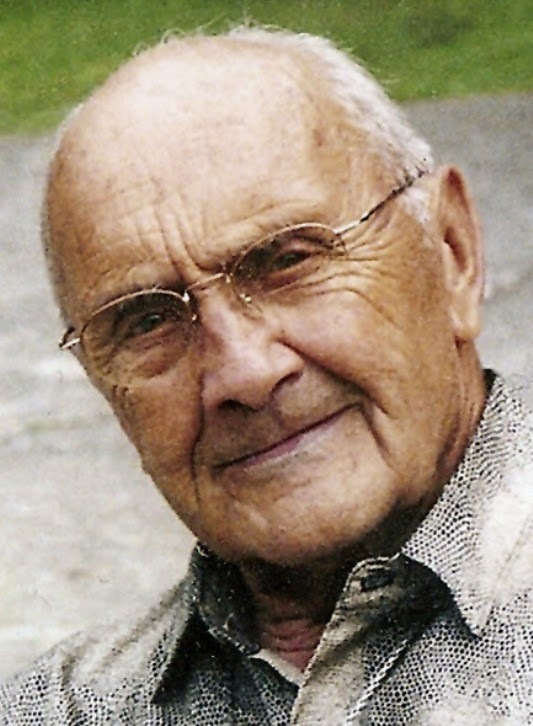 Frank A. O'Brien. [Louise was in ecstasy at the time of the visit] "....The first of our party to step forward and bless her was Rev. A., and, in response, Louise smiled. This so-called "Smile" is not really a smile, in the natural order, but a peculiar lighting up of her countenance, her lips opening enough to see the teeth. As a test of her mystical recognition, Rev. S. was dressed as a farmer and normally wears a slight beard on his chin, and on this day, not having shaved, and wearing his duster (which ought to have been white), he had anything but a clerical appearance. He stepped forward to the foot of the bed and blessed her. As she responded, by the peculiar smile, a prolonged "Oh!" was heard all over the room, in the supposition that Rev. S. was what he appeared—a dutch farmer. M. Cure and the newspaper man simultaneously exclaimed: "Monsigneur, is that gentleman a priest?" and having answered in the affirmative, a joyous "Oh!" re-echoed once again through the room. Now, Mr. M., as you remember, was mistaken for a priest in Chicago; and, several times on our European trip, he was believed to be my reverend companion. He advanced to bless her and did it in a very patriarchal manner, forming a large cross in a very solemn way, but Louise did not smile. This so forcibly struck the old gentleman, that he turned away and wept bitterly. 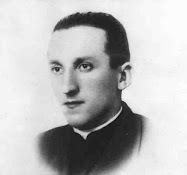 Next, the Benedictine Father from England, went around, stood behind the headboard of the bed, and, from there, blessed Louise, which she again acknowledged by the beautiful "Smile." All these experiments were made in solemn silence, all eyes being fixed on the Ecstatic, and the hearts throbbing in admiration of the marvels witnessed. Yesterday, Monsigneur Dumond, speaking to me of the Ecstatic, said: "I do not know, and wished not to be informed, whether your pectoral cross has a 'Relic of the Holy Cross' enclosed in it. But if it has that relic in it, I will now state how Louise Lateau will act when you present it to her: She will rise in her bed in a sitting posture, and hold the cross in her folded hands; her countenance will beam with joy, and she will thus remain till you take it away. And, Monsigneur, I do hereby give you all the authority which I have in her regard." Of course, I was anxious to verify this statement, made one day before our arrival at Bois d'Haine. 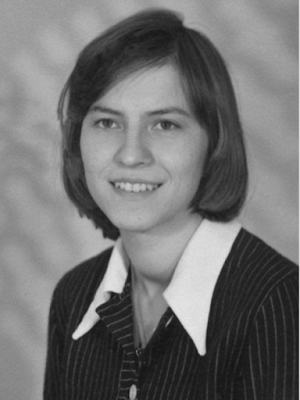 Therefore at the right moment, I took off my pectoral cross and held it by the chain over the breast of the Ecstatic. Like a flash she arose, bent over in a complete semi-circle, holding my cross in her tightly-clasped hands, her eyes raised to Heaven, and her countenance beaming with joy, as if lit up by a Divine ray. I again took hold of the chain, without intending to take the cross away from her, and began to pull upwards, when I discovered, to my greatest amazement, that I could lift the Ecstatic at will, as if she weighed but a pound. But my amazement increased to awe, when, in obedience to my thought, the Ecstatic promptly relaxed her hold of my cross and dropped, as if dead, on the bed. She had firmly clasped the cross with both hands all bloody—the precious streams flowing down the wrists for several minutes. But my cross had not a stain of blood on it — yes, it looked as if it had just been polished. A new revelation had been made, and for the confirmation of it, I commanded her, in thought, to consciousness. At once she obeyed, turned her head towards me, and looked inquiringly at me. In thought again I said [only in thought, not aloud], "That is enough," and her head that moment dropped back, her eyes were fixed, and, as before, she ceased to breathe, at least as far as I could notice. It is said that Louise understands and speaks only the French language, but I am convinced, by the experiment made by me, that in her ecstacy she understands equally well English, German and Latin." 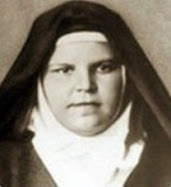 Beginning on March 26, 1871 and continuing until her death in 1883, that is for 12 years, she ate no food whatsoever, and lived entirely on the Holy Eucharist. She drank only an average of 3 to 4 glasses of water per week. This extraordinary grace brought her some additional unwanted attention from the popular press, at least one of whom dubbed her as the “Belgian fasting girl”. 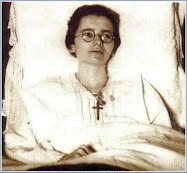 Additionally for this same period of 12 years, she did not require any sleep at all, and normally passed her nights in contemplation and prayer, often kneeling at the foot of her bed. 1. After Louise showed the first signs of bleeding on April 24, 1868, she continued to bleed every week until her death on August 25, 1883. All-in-all, the total number of bleedings was approximately 800. 2. 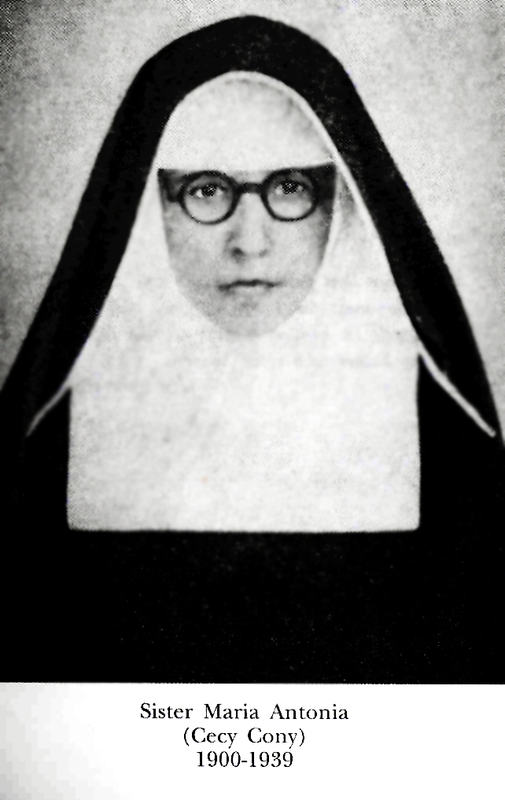 Louise first felt the burning pains of the stigmata on Tuesdays, and this continued through Thursdays. Come Thursday, these pains turned into blisters which would form over the stigmata, especially evident on the back of her hands. 3. The wounds that formed on her hands and feet were of a dark red color that was circular in fashion. 4. Intense bleeding usually occurred from Thursday or Friday nights through Saturday. The beginning of the bleeding normally started between midnight and one in the morning. 5. About 250 grams of blood was lost during each Passion ecstasy. 6. The wound on Louise's side was located between the fifth and sixth ribs, a little below the left breast. 7. The foot wounds were located between the third and fourth metatarsals. Both feet (as well as the hands) were marked with the same identical wounds. 8. The crown of thorn wounds was seen as a circular pattern of some twelve to fifteen points that formed around the forehead. This area was painful and swollen. 9. The scalp showed evidence of hemmorhaging as well. 10. A fresh lesion was observed on the right shoulder, a reminder of the Cross that Christ carried on His way to Calvary. After an extraordinary life of love for God and of suffering in union with Jesus for the conversion of sinners, Anne-Louise Lateau died on August 25, 1883 at age 33 -the same age as her beloved Jesus. 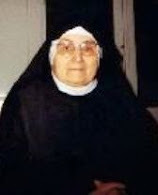 In 1991, the Cause for her Beatification was officially opened. ~Anne-Louise Lateau, pray for us! Source for this article is the book “A Visit to Louise Lateau” by Rev Father Gerald Malloy D.D., Published by London Burns, Oats and Co, 1873, and available from Google Books for free viewing or downloading in its entirety here: "A Visit to Louise Lateau"
Amazing... Oh..how can I ever be like her even in the tiniest %??? She reminds me of the stories in EUCHARISTIC MIRACLES by Joan Carrol Cruz. I am so grateful for this website. I am really glad to hear that you are enjoying the website, abd that you are inspired by the holy life of Louise Lateau... I too was inspired and edified while studying her remarkable life. 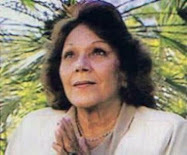 Her love and devotion to God was extraordinary. Peter at the Guadalupe House Blog kindly shared a photo of a holy card of Louise Lateau, and I added the photo to the article above--it is the 3rd photo from the top. ...Anne Louise Lateau,pray for Us..
Hello, what a beautiful and holy soul. 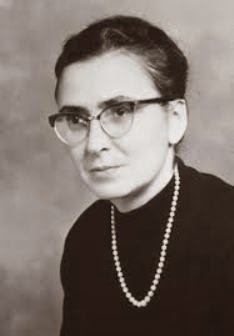 Why would the Vatican gave a negative answer to an enquiry wishing to further the cause for her possible beatification in March 5, 2009? It doesn’t make sense.